I just looked at the title of this blog post and for a second, thought perhaps it had to do with a summer romance. Like almost all females having experienced their teens in the late 70’s, Sandy and Danny Zuko come to mind, and right now I’m singing “Summer lovin’ had me a bla-aast, summer lovin’ happened so fa-aast…” And now unfortunately, you’ll be singing it too. Sorry. But this post isn’t about that. 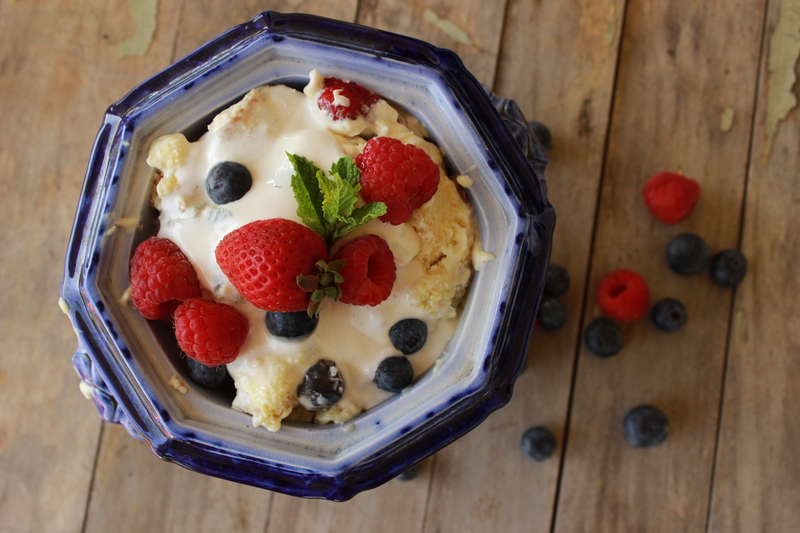 It’s about a fruit-filled trifle that has become one of the tastes of summer for me and my family. You know, like watermelon says summer. Corn-on-the-cob says summer. Hamburgers on the grill say summer. Like that. When I met my husband, and knew he was the one for me, I wanted to get to know his family too, because after all, they were going to also be my family. While my own mom is a great cook, I learned a lot from his mom. After her kids were all in elementary school, she went back to school to become a dental hygienist, and during her studies, took several courses on nutrition. That made an impact on the way she shopped, ate and cooked; she became a vegetarian. So fruit was the primary ingredient in her desserts, and this trifle is an offshoot of one that she made when my husband was little. I’m pretty sure hers is healthier than mine, and would still be delicious, but this is one of those recipes that if I changed it, everybody in the house would let me know with every bite just how cruel I am. We have a tradition each 4th of July to picnic with another family on a little peninsula on the Tennessee River. We leave the house in the late afternoon, take a few blankets, some games, and spend the evening with our friends in anticipation of the fireworks show after dark. 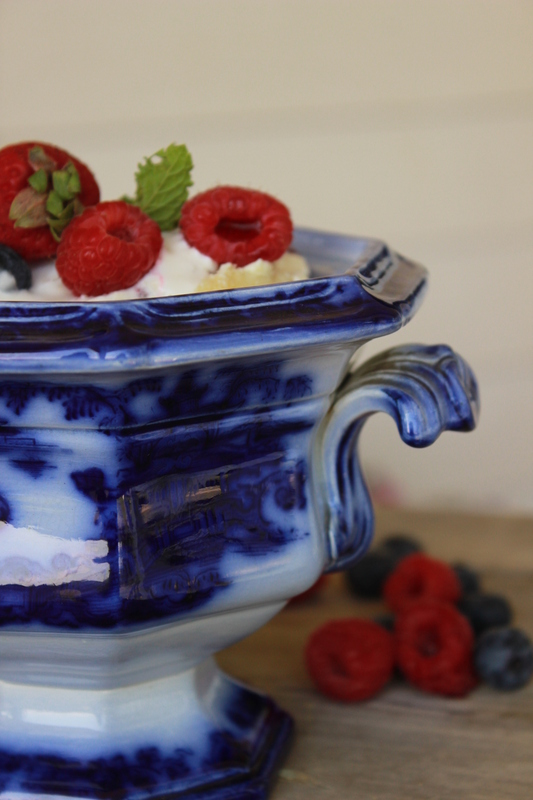 Our friends bring vegetables from their garden and an old-fashioned ice cream churn to make vanilla ice cream. I bring a grilled chicken salad served in croissants. 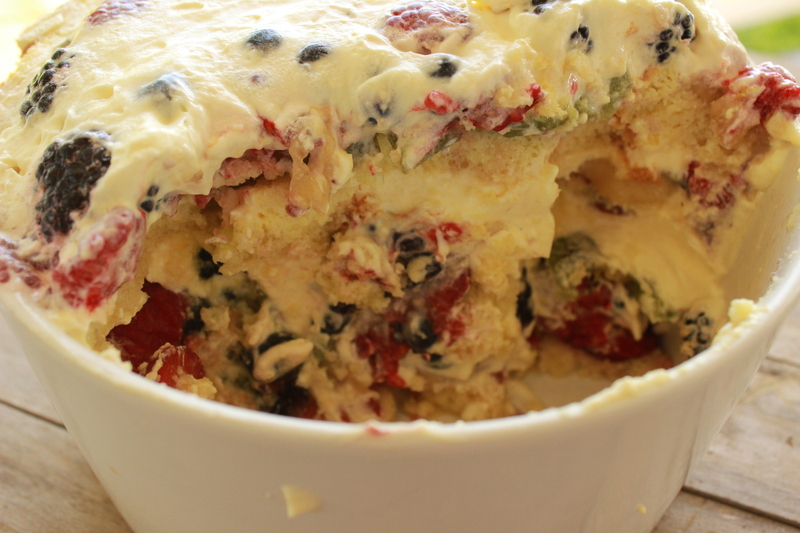 And this trifle. Normally, I make a HUGE bowl because we just might eat this for breakfast it’s so good and everyone wants multiple servings. This year, several of our families’ kids weren’t in attendance, so I made a “normal” amount. In reality, I just halved the recipe, but I understand that most people don’t want a bowl the size of Texas in their fridge for a week. However, if you want to make this for a summer shindig, by all means, double the amounts I’ve given you! Prepare cake in 9 x 4 ½” loaf pan. Cool. Prepare pudding while cake is cooking. Set aside a few tablespoons of Cool Whip for garnish later. 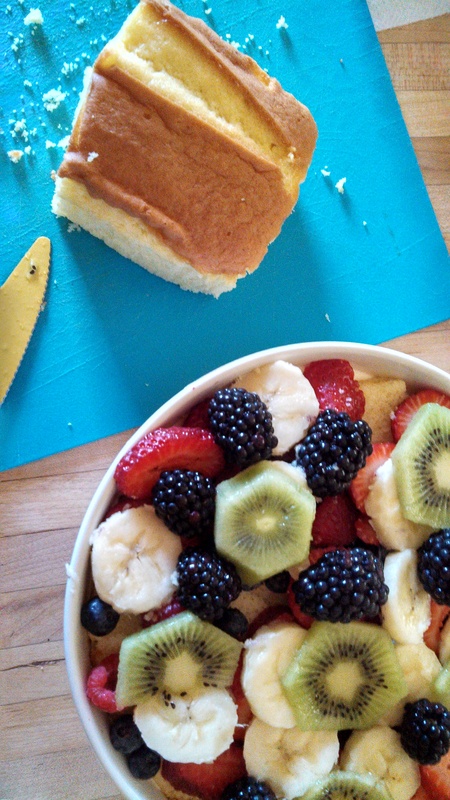 Set aside a handful of berries to garnish on top as well. Mix pudding with the remainder of the Cool Whip and refrigerate. Slice cake in 1″ slices. 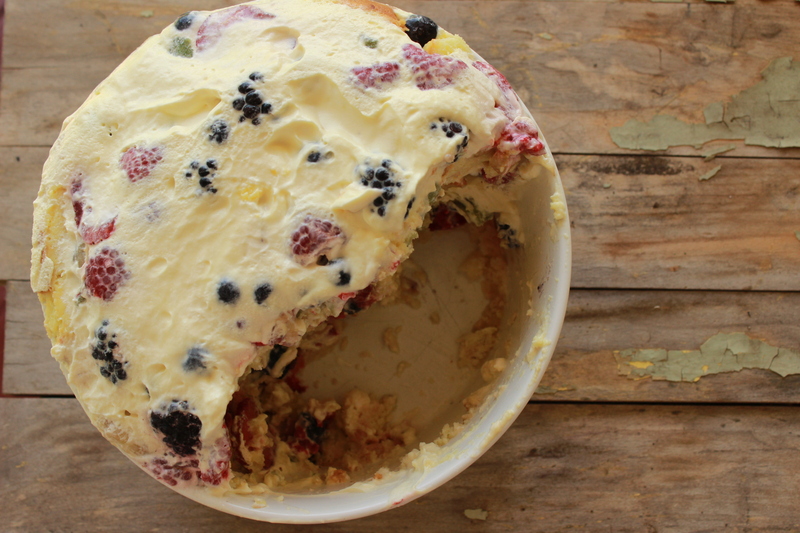 In a trifle bowl, layer cake, then a mix of the fruit to cover cake, and finally the pudding mix. Repeat layering as many times as necessary, ending with the pudding mixture. 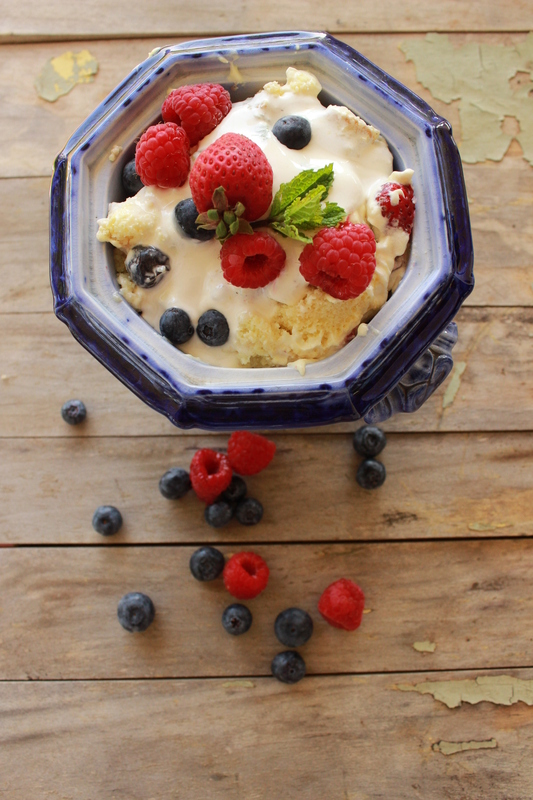 Garnish with remaining Cool Whip, fresh berries, and mint, if desired. -This is SO much better if it’s prepared a day ahead. The fruit juices soak into the cake and the flavors have time to marry. -As I mentioned earlier, this could be healthier. I have made it with angel food cake before and it’s still good. Preheat oven to 325°. Place flour, sugar, butter, milk, eggs, and vanilla (in that order) in the bowl of a heavy-duty mixer. Beat at low speed 1 minute, stopping to scrape down sides. Beat at medium speed 2 minutes. Pour and Bake. Pour into a greased and floured 9 x 5 loaf pan, and smooth the top. Bake at 325° for 1 hour and 30 minutes or until a long wooden pick inserted in center comes out clean. Cool in pan on a wire rack 10 minutes. Remove from pan to wire rack, and cool completely (about 1 hour). *If doubled, prepare in a tube or bundt pan.